We hunkered down to wait out the ice storm, which was quite doable for us. Especially for Norm and Tucker, as you can see. 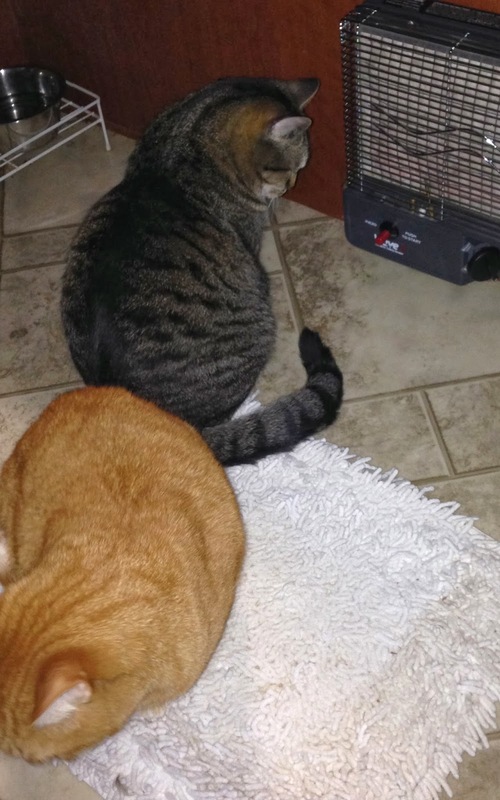 Initially, I had nothing down in front of my Wave 3 Catalytic Heater and they were both hugging the heater. The white mat, is the worthless as a bath rug that Camping World sells. I now use it for a mat for the cats. Below, the back window is too wet to show the icicles on the ladder rungs, but they were there, melted off and re-appeared later yesterday. When the rains slowed to a mist, the trees surrounding this lake I’m by, turned white with icy fingers. Fortunately, it didn’t last very long. Not too many branches came down, but heard other places further inland were hit hard. Mid morning… Norm had quite the conversation going with me. He was so animated, you had to just watch and smile… Perhaps I’m becoming the Cat Whisperer… laughing here. 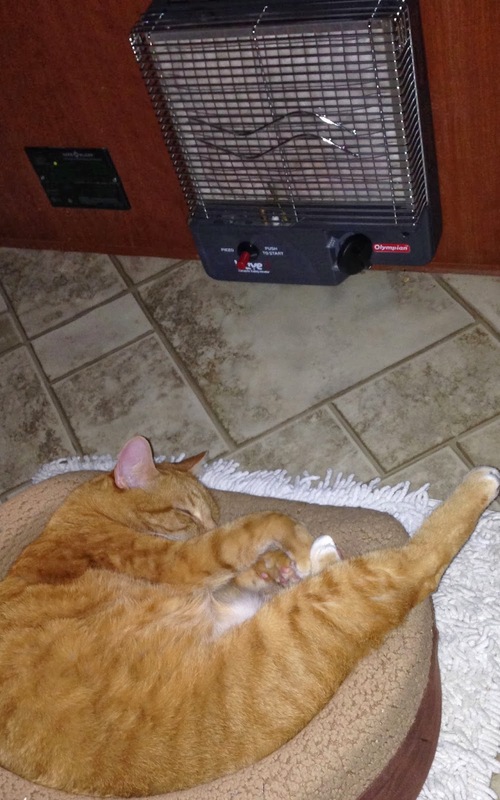 But the way he carried on, I ended up grabbing one of the cat beds… bit more chattering and far less animated… and I put it in front of the Wave 3 heater. And this is the result, below. Not a peep out of him the rest of the day!!! When this heater has cooled off and is not in use – I put the cover over it and its protected until the next use. I have it mounted in the only place in my rig it could go – right smack under my oven. It is T’d into the oven/cook top source of propane. And right next to the Propane detector. Its one of the most efficient heater, as it does not use much propane at all. 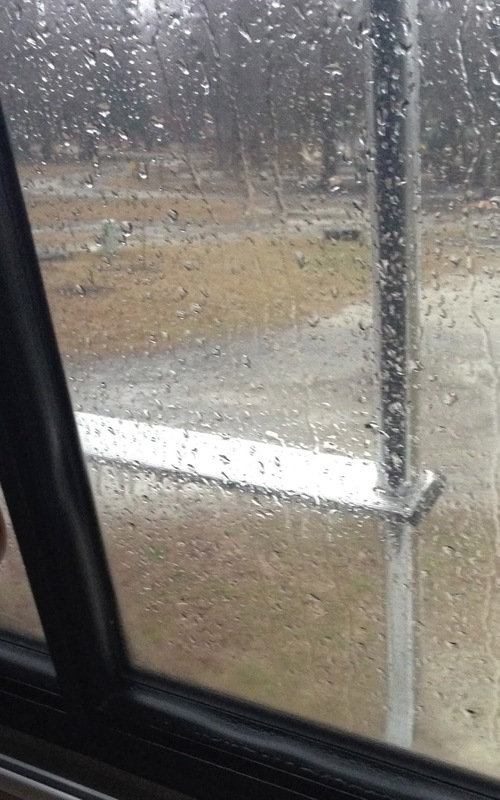 Speaking of which… here in South Carolina, propane prices have skyrocketed to $4.65/gallon. Egads! I think I would have been in front of the Wave 3 also. Its aimed at the underneath of the dinette table. The best distance from source to heat surrounding areas best, except when the critters are being rather piggish on the coveted heat – laughing here. It easily keeps my rig 20º warmer than outside temperatures. I had no complaints yesterday. It works fabulously! The weather all over the U.S. is crazy isn't it Alaska probably have better winter than the lower states. Glad things better with you and boys sounds like had rough time for a bit. We came home from Texas to snow and cold but was nice to be home Texas was colder than past 2 yrs but was nice to get away.